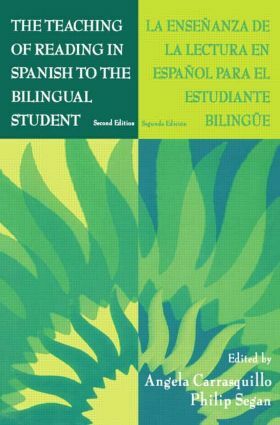 This dual-language text provides theory and methodology for teaching reading in Spanish to Spanish/English bilingual or Spanish-dominant students. The goal is to help educators teach these students the skills necessary to become proficient readers and, thus, successful in the school system. At the very core of the book are the hispano-parlantes--the Spanish-speaking children--who bring to the schools, along with their native language and cultures, a wealth of resources that must be tapped and to whom all educators have a responsibility to respond. True to the concepts of developing bilingual educators to serve bilingual students, the text presents chapters in English and Spanish. Each chapter is written in only one language at the preference of the author. Thus, to be successful with this book, the reader must be bilingual. Themes emphasized in the text include current reading methodologies, the concept of reading as developmental literacy skills, reading in the content areas, new views of the development of proficiency in the second language, issues related to students with special learning needs, assessment, and the uses of technology in the delivery of instruction. Never losing sight of its goal--to teach reading in Spanish to bilingual or Spanish-dominant students--the book includes a series of focusing questions and follow-up activities; these are not simply translations of existing activities, strategies, and techniques intended for monolingual English students, but specifically designed to be appropriate for Spanish-speaking students. Directed to university preservice and in-service instructors of reading and bilingual education as well as administrators and district- and school-level staff developers who work with Hispanic populations, the book is sensitive at all times to nuances of the languages and cultures of the intended audiences. "Preservice and practicing teachers in conventional bilingual programs with Spanish-dominant or native Spanish speakers will benefit significantly from the text, but other professionals working in bilingual programs with native and non-native Spanish speakers may also profit from the wealth of practical suggestions." "…The alternate presentation of content in each of two languages is a powerful way of demonstrating the utility of bilingualism, and an affective way to reach readers of the text, whatever their language dominance might be." Contents: Preface. Introduction. A. Carrasquillo, Bases Teóricas Para La Enseñanza de la Lectura en Español. A. Rodríguez, Jr., Research Summary on the Teaching of Reading in Spanish to Bilingual Students. A. Carrasquillo, The Teaching of Spanish Literacy Development. A. Carrasquillo, Teaching Reading Comprehension Skills. E. Azurdia, Integrando la Fonética en el Proceso de la Lectura en Español. A. Carrasquillo, Métodos Más Conocidos en la Enseñanza de Lectura en Español. P. Segan, J. Aquino, Spanish Literacy Development in the Content Areas. F. Segan, Teaching Reading to Bilingual Students With Disabilities. G. López-Díaz, Recursos a Utilizar en la Enseñanza de la Lectura en Español. P. Segan, Spanish Reading Assessment. Appendices: Competencies for Teaching Reading and Language Arts in Spanish. Vocabulario Básico Relacionado con la Enseñanza de la Lectura en Español.